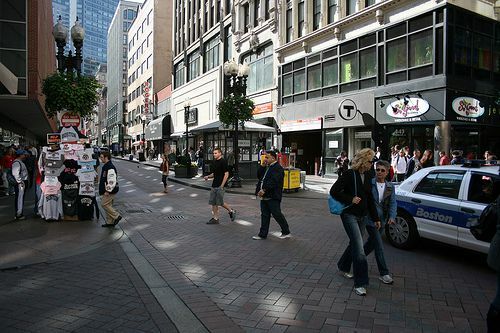 Many narrow or crowded downtown streets operate informally as shared streets during rush hour or at lunchtime, but are not regulated as such. 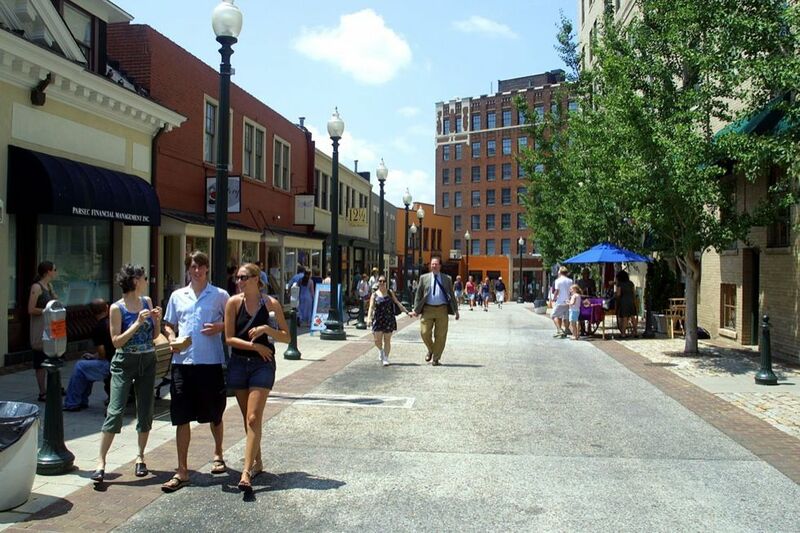 A commercial shared street environment should be considered in places where pedestrian activity is high and vehicle volumes are either low or discouraged. 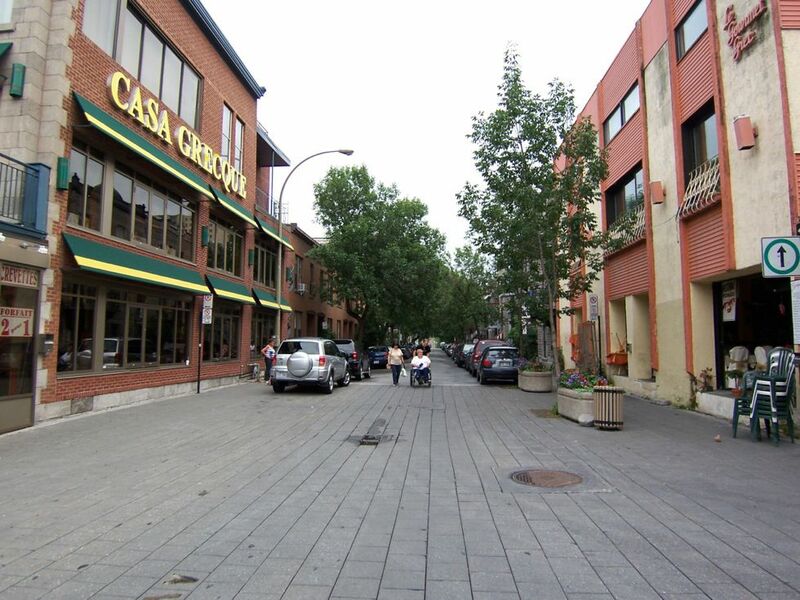 Commercial shared streets can be designed for narrow or wide cross sections, but become increasingly complex and difficult to maintain as a shared space as width increases. 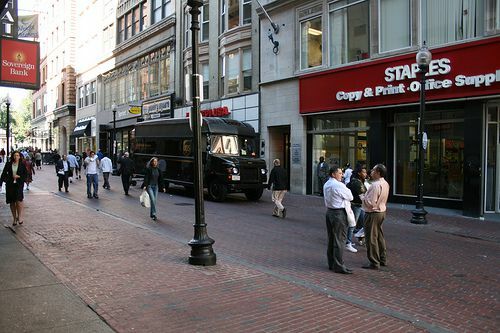 Commercial shared streets differ from this earlier generation of pedestrian malls in both their regulation and implementation. 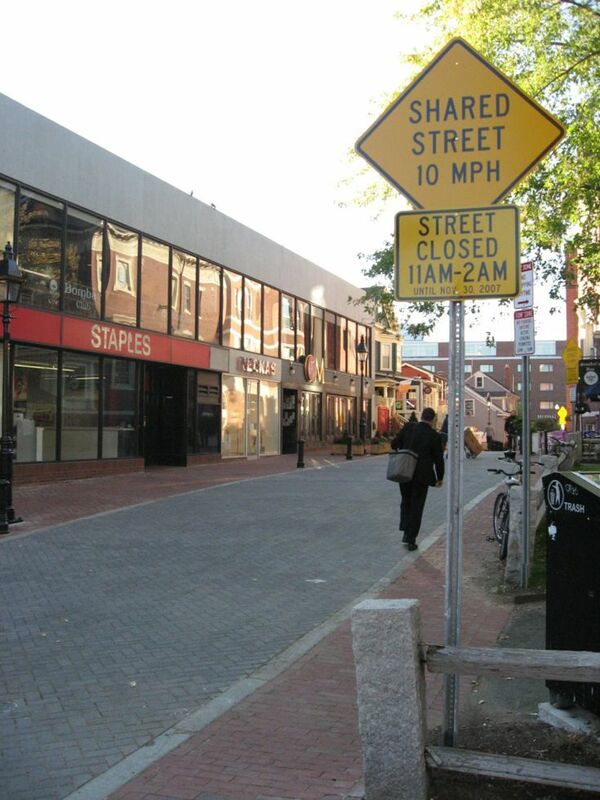 Shared streets maintain access for vehicles operating at low speeds and are designed to permit easy loading and unloading for trucks at designated hours. 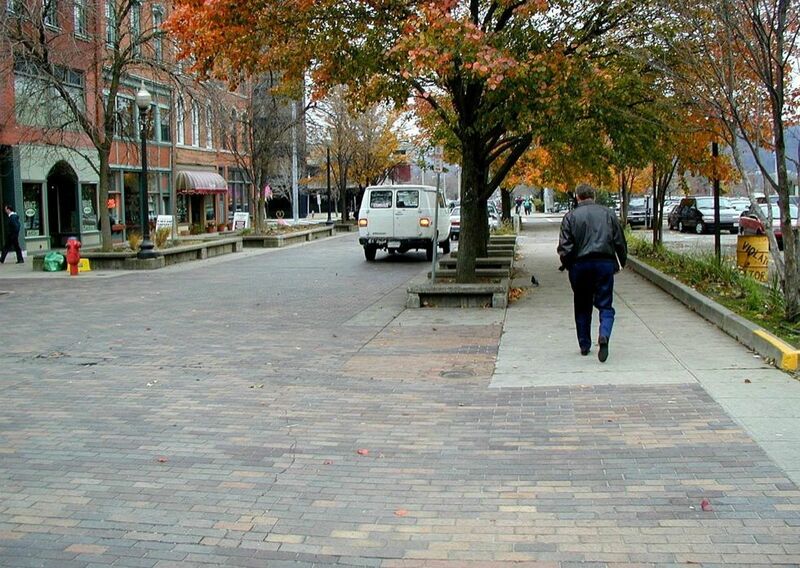 they are designed to implicitly slow traffic speeds using pedestrian volumes, design, and other cues to slow or divert traffic. 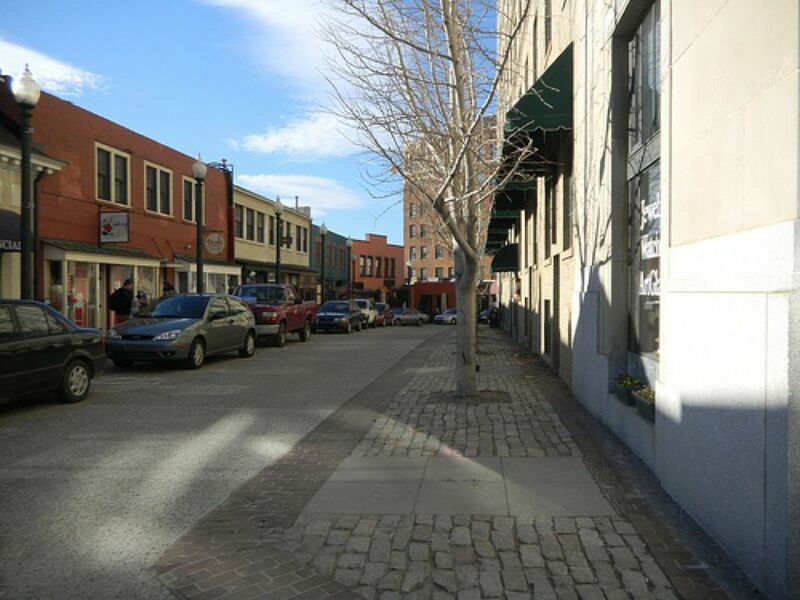 The street illustrated below depicts a 22-foot shared way within a 30-foot right-of-way. 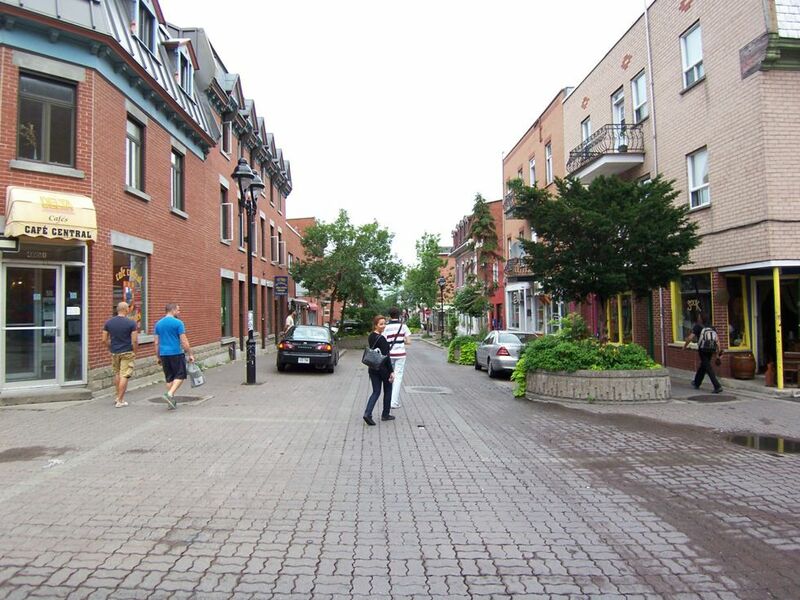 A commercial shared street environment should be considered in places where pedestrian activity is high and vehicle volumes are either low or discouraged. 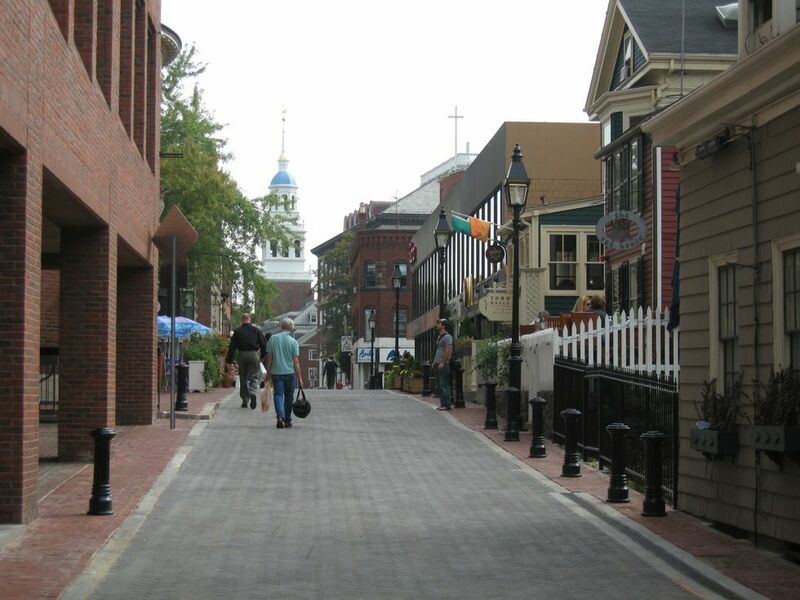 The downtown street in the rendering above is a common sight in many older cities where downtown commercial streets may predate wider grid streets. 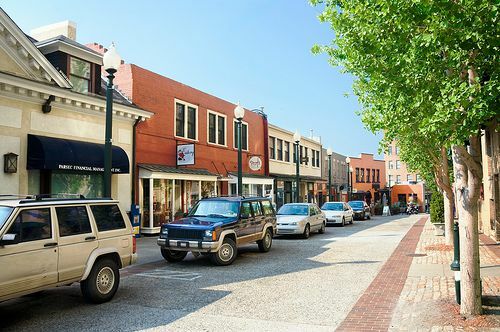 In newer cities, a retail district with heavy parking utilization and narrow, congested sidewalks may have similar conditions or opportunities. 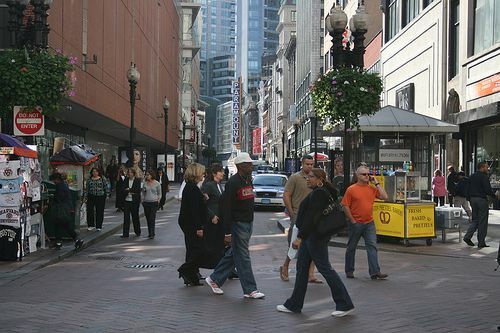 1 Sidewalk congestion creates unsafe conditions, as crowding forces some pedestrians to walk in the street to avoid crowds. 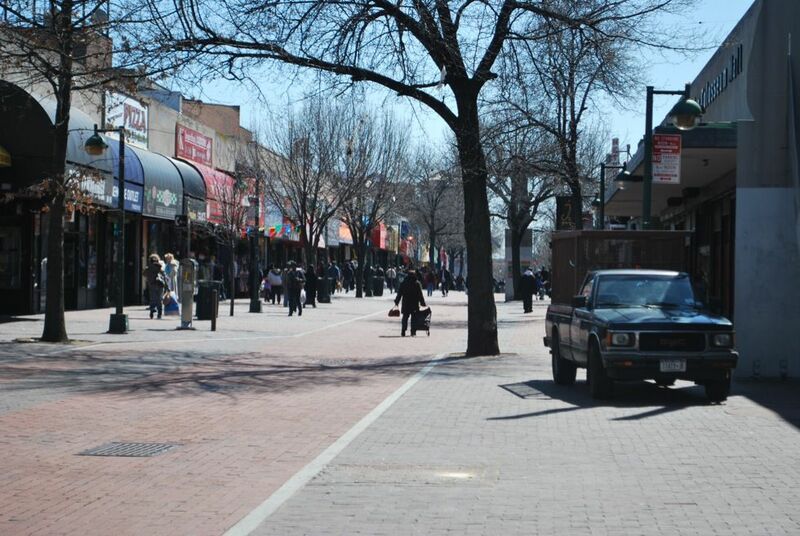 Vehicles in search of on-street parking create traffic congestion. 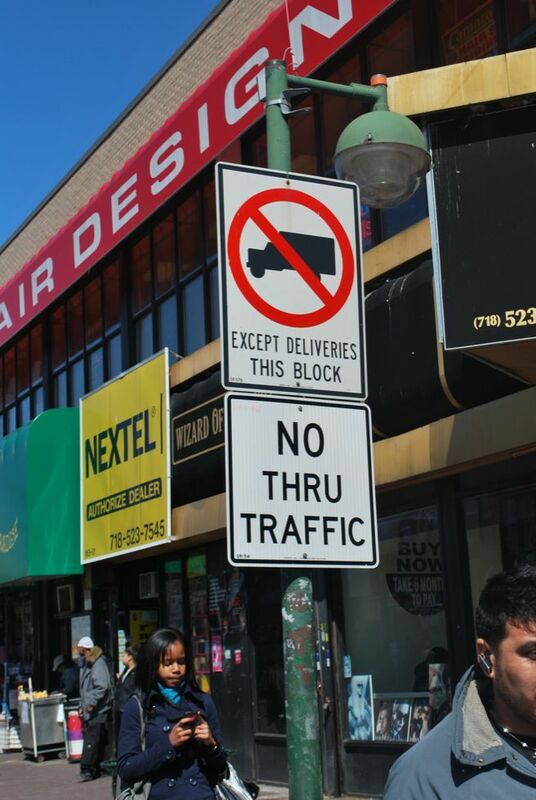 2 Loading and unloading trucks obstruct pedestrian and vehicle traffic. 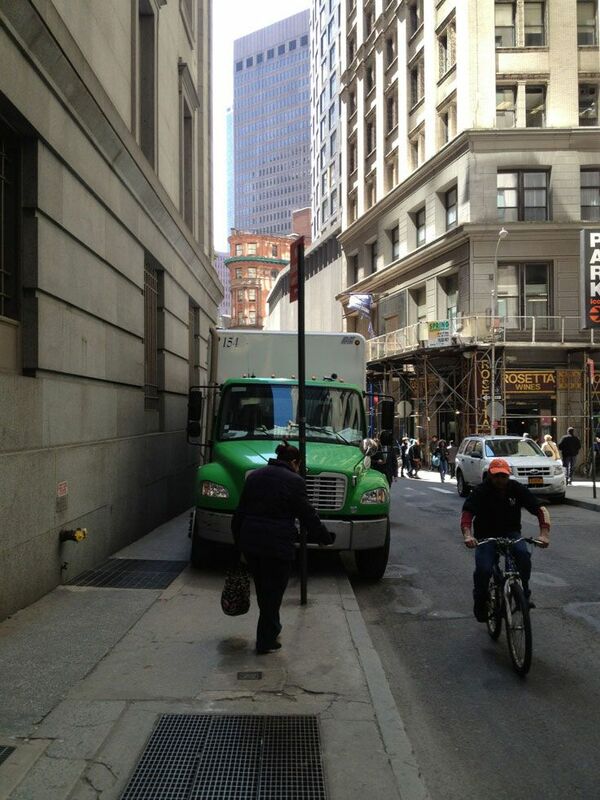 Truck drivers park on the sidewalk to preserve vehicle flow while unloading, forcing pedestrians to mix with motorists. 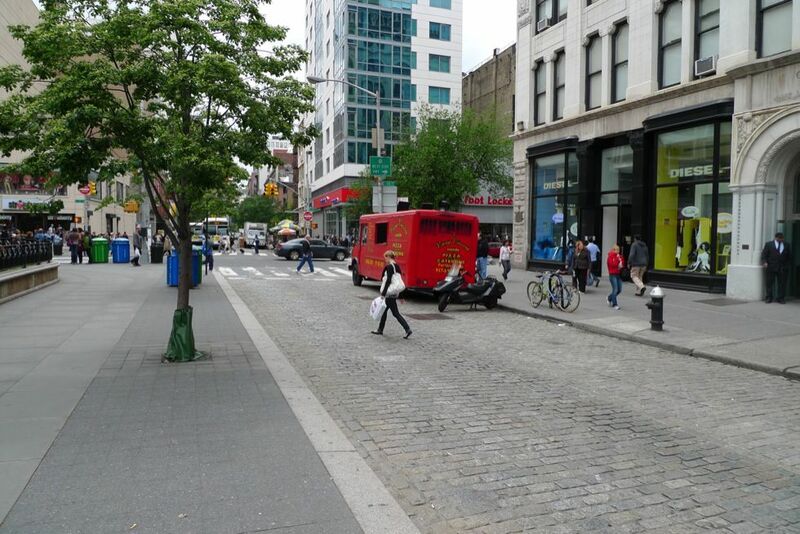 4 Commercial shared streets should be accessible by single-unit trucks making deliveries. 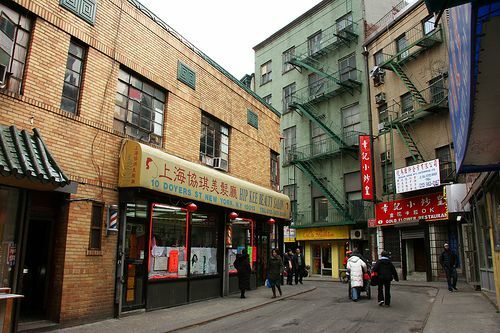 Where commercial alleys are non-existent, it may be advantageous to design a shared street to accommodate large trucks, though significant changes to the design should be avoided. 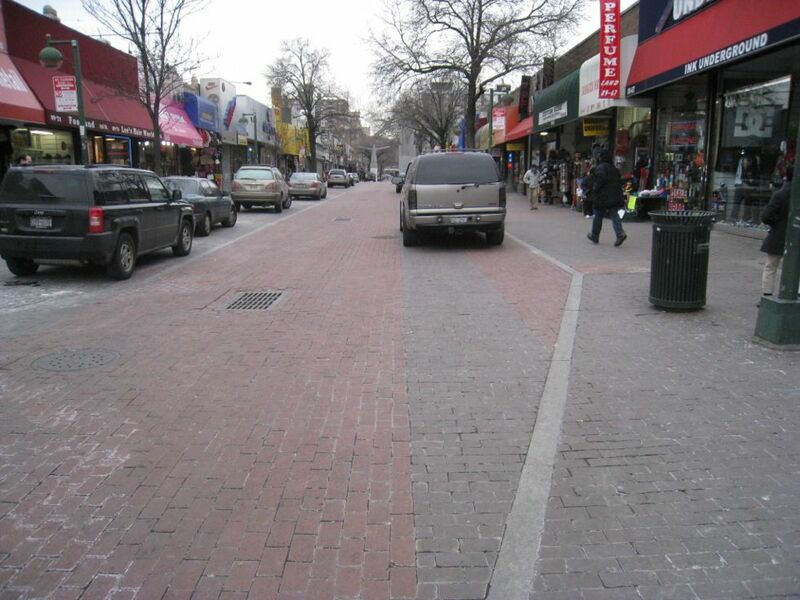 Designated loading and unloading zones may be defined through differences in pavement pattern or use of striping and signage. 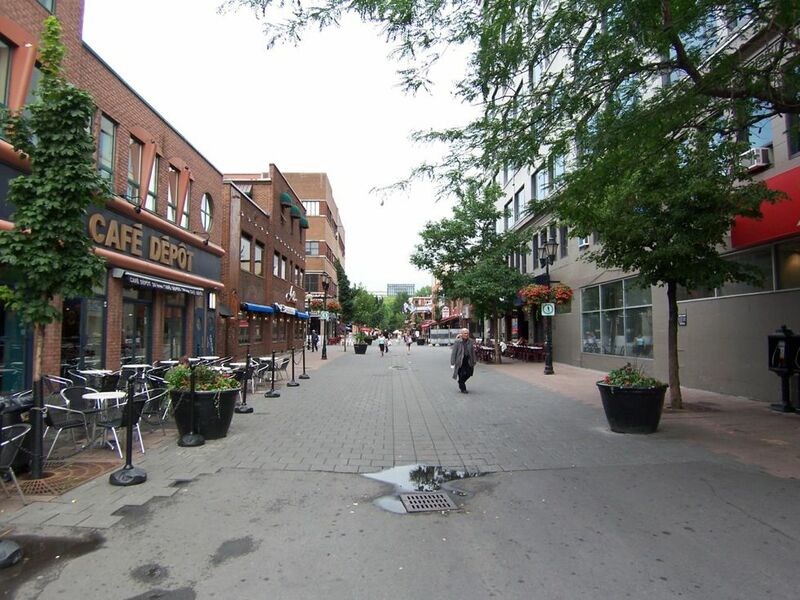 5 Street furniture, including bollards, benches, planters, street lights, sculptures, trees, and bicycle parking, may be sited to provide definition for a shared space, subtly delineating the traveled way from the pedestrian-exclusive area. 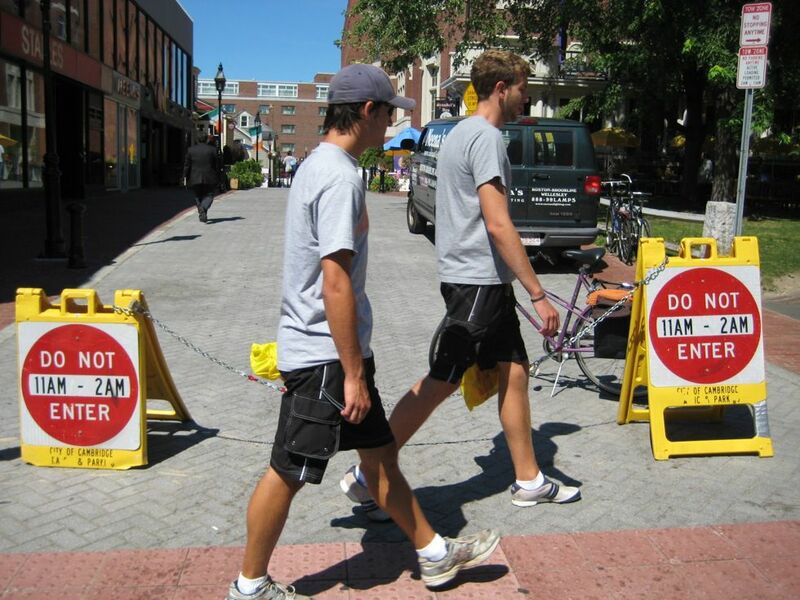 Shared streets may be closed to through traffic for specific portions of the day. 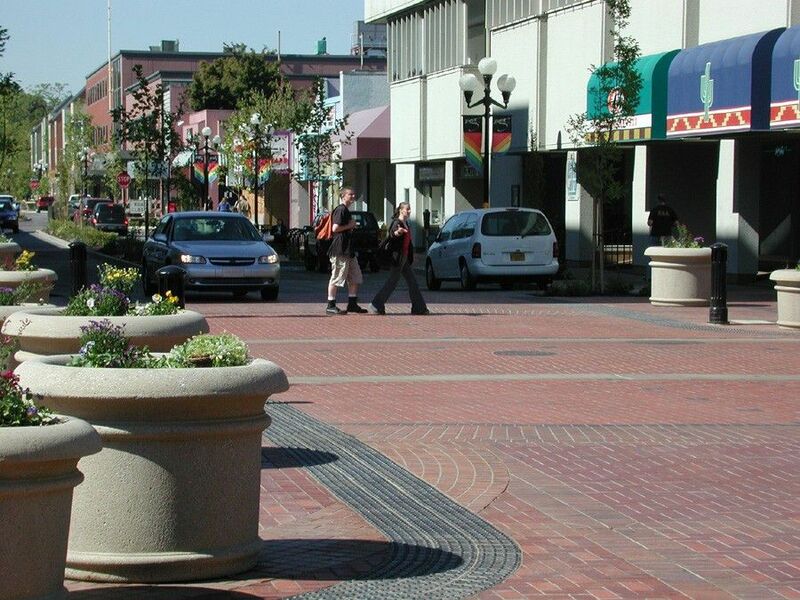 Use movable planters and time-of-day restrictions to regulate the shared space. 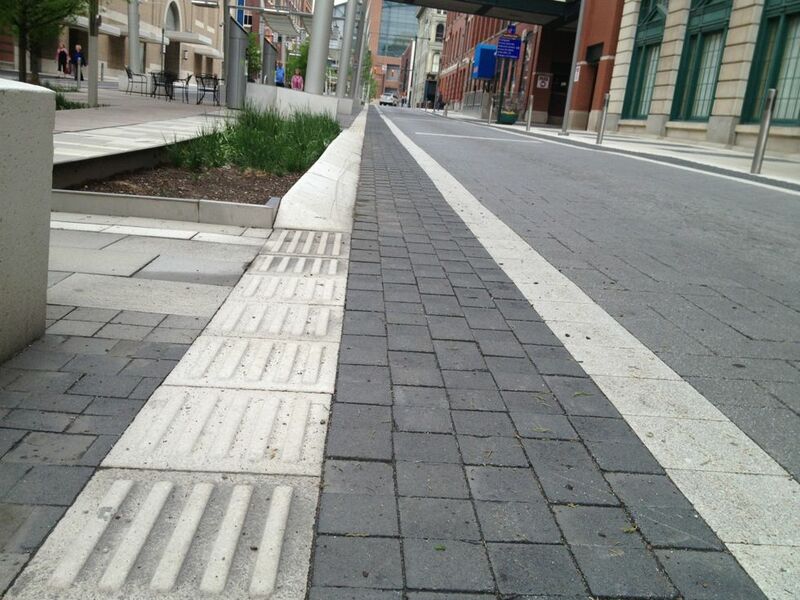 Provide tactile warning strips at the entrance to all shared spaces. 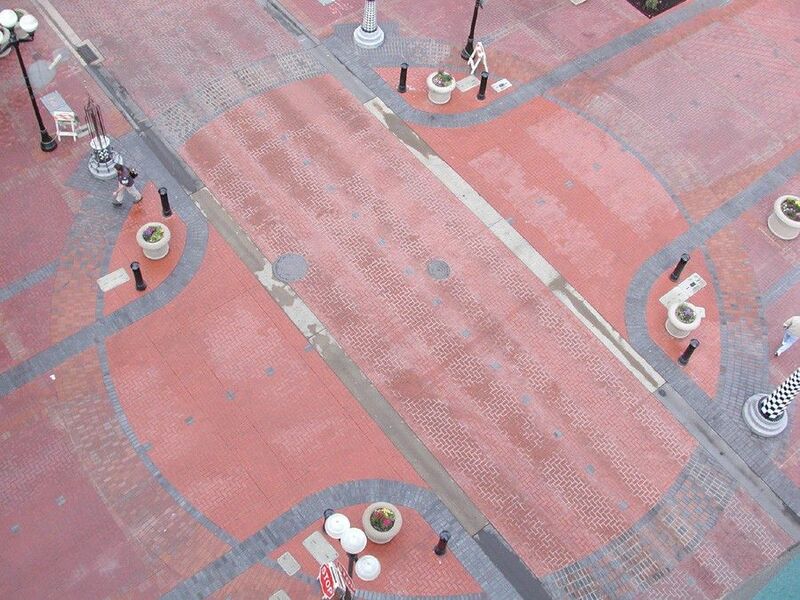 Warning strips should span the entire intersection crossing. 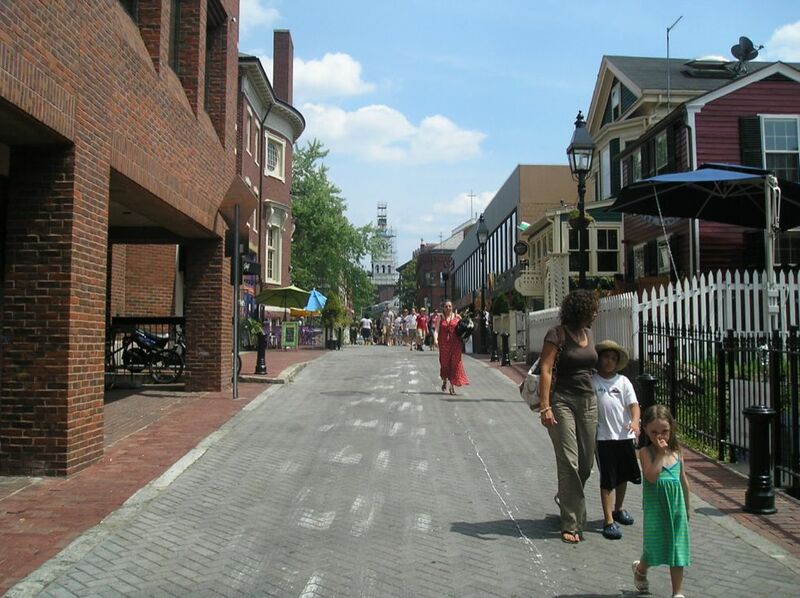 Prior to the application of a shared street, cities are encouraged to experiment with car-free hours or to test a conversion using temporary materials to evaluate the potential impact on traffic operations. 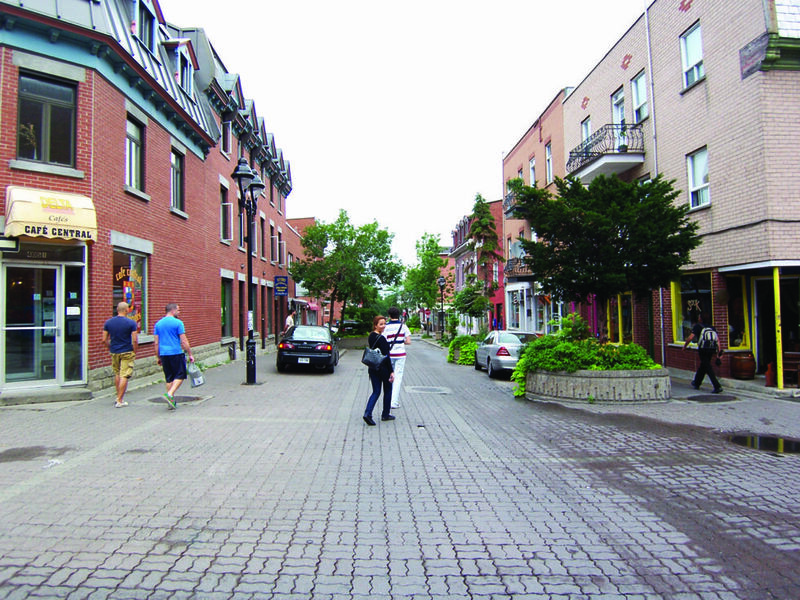 Depending on the overall street width, designers may consider providing a 3–5-foot-clear path protected from traffic. 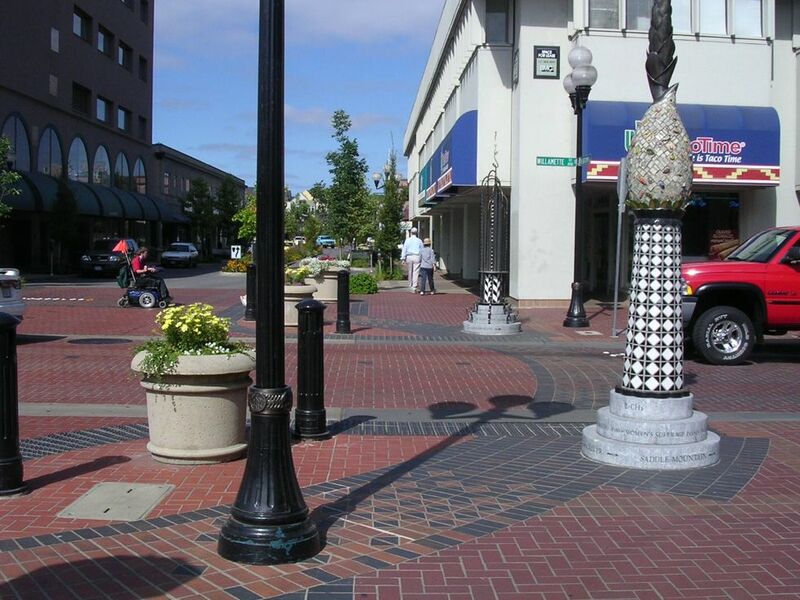 The clear path should be defined using planters, bollards, and street furniture, as well as detectable warning strips or textured pavers. 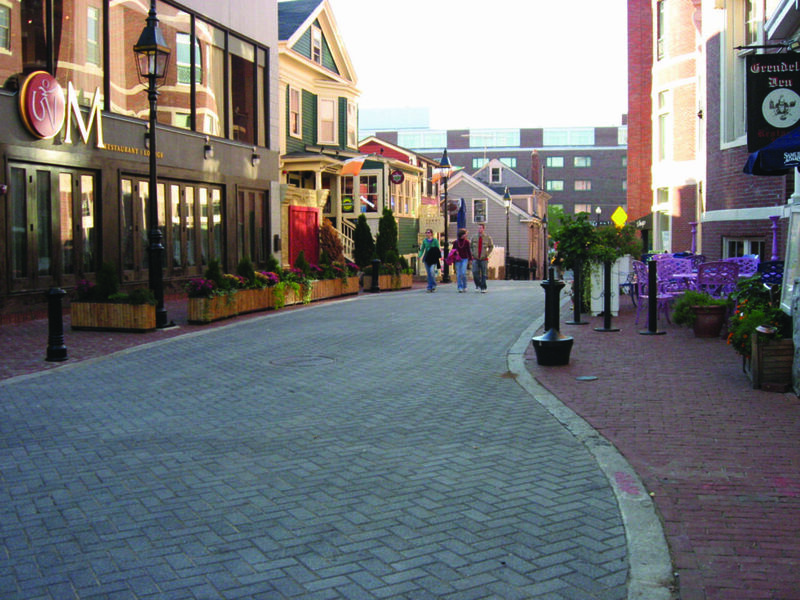 For narrower shared streets and alleys, use of a clear path is discouraged. 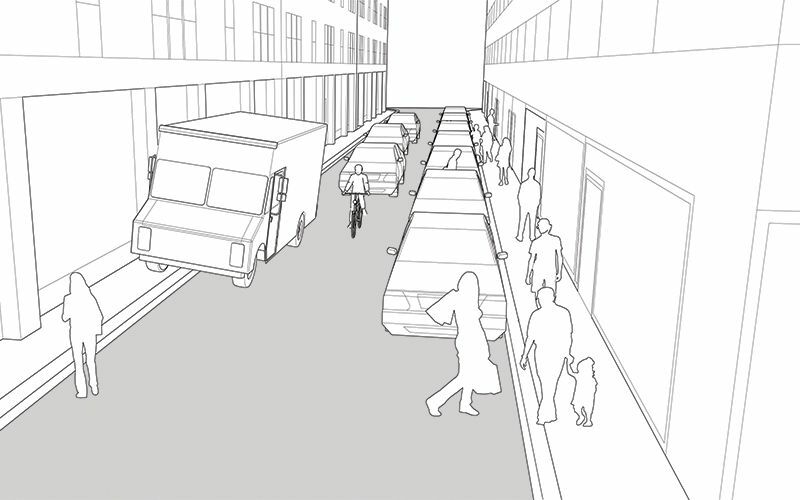 Roberto Brambilla and Gianni Longo, For Pedestrians Only: Planning, Design, and Management of Traffic-free Zones, (New York: Whitney Library of Design, 1977). 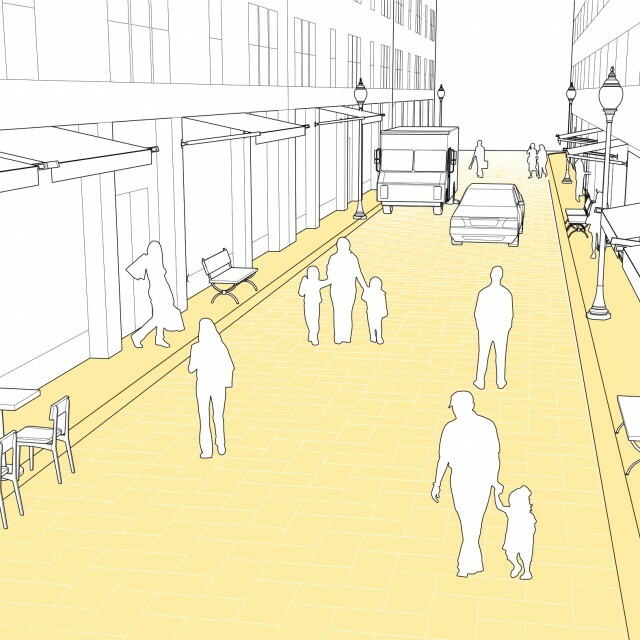 The San Francisco Better Streets Plan provides guidance on “channels” and “runnels” that may be suitable for center street drainage. “Channels and Runnels,” San Francisco Better Streets: A Guide to Making Street Improvements in San Francisco, accessed May 21, 2013, http://www.sfbetterstreets.org/ find-project-types/greening-and-stormwater-management/stormwater-overview/channels-and-runnels/. 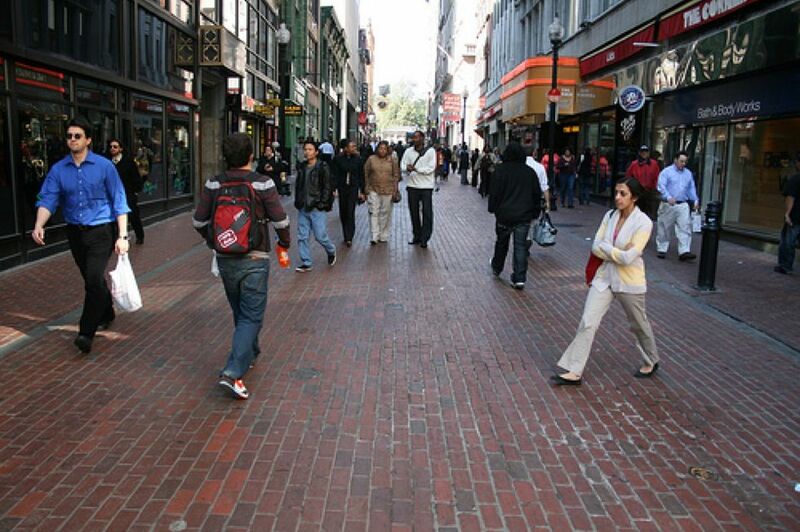 “Transit Mall Case Studies,” (San Francisco County Transportation Authority). Department of Transport “Shared Space.” Local Transport Note 1/11. London: 2011. Pojani, Dorina. 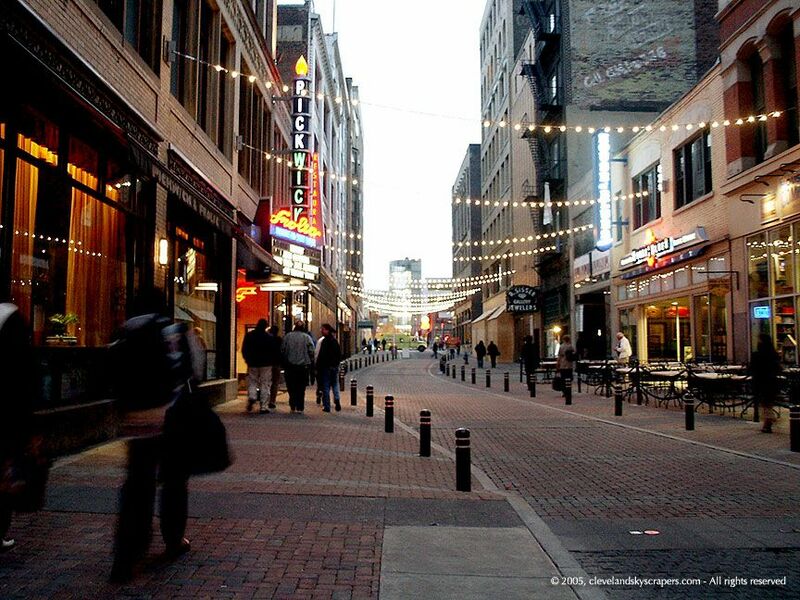 "American Downtown Pedestrian ‘Malls’: Rise, Fall, and Rebirth." Territorio (2008): 173-190. San Francisco County Transportation Authority. 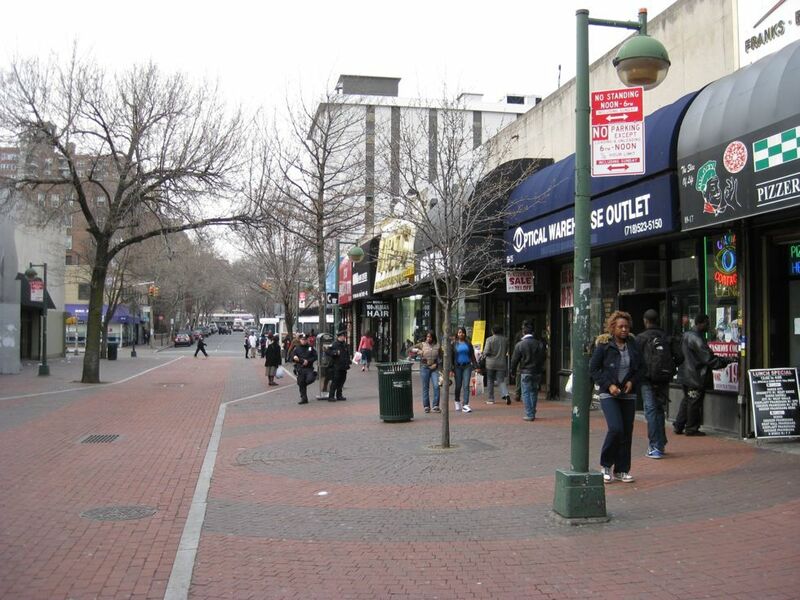 Transit Mall Case Studies. 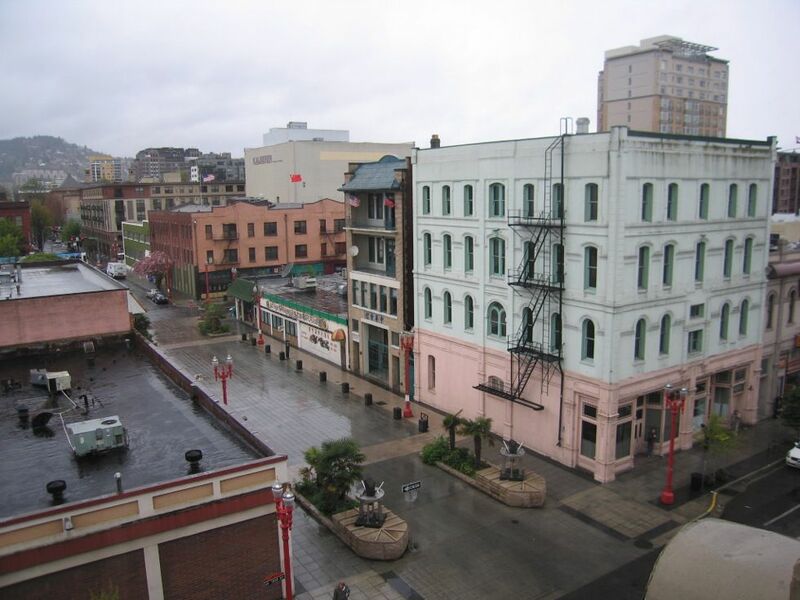 San Francisco: 1-17. Schmidt, Jessica. 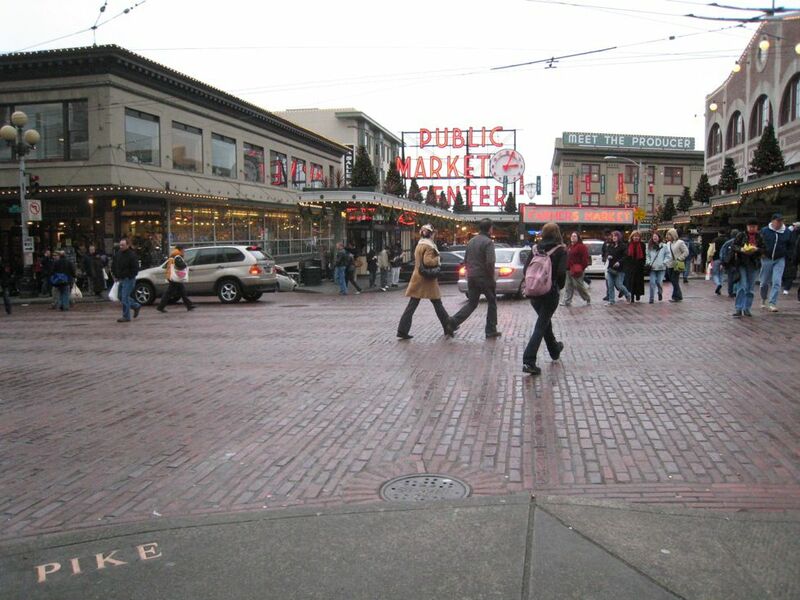 "Revisiting Pedestrian Malls." Prepared for the ITE 2010 Technical Conference and Exhibit, Savannah, Georgia, March 14-17, 2010. 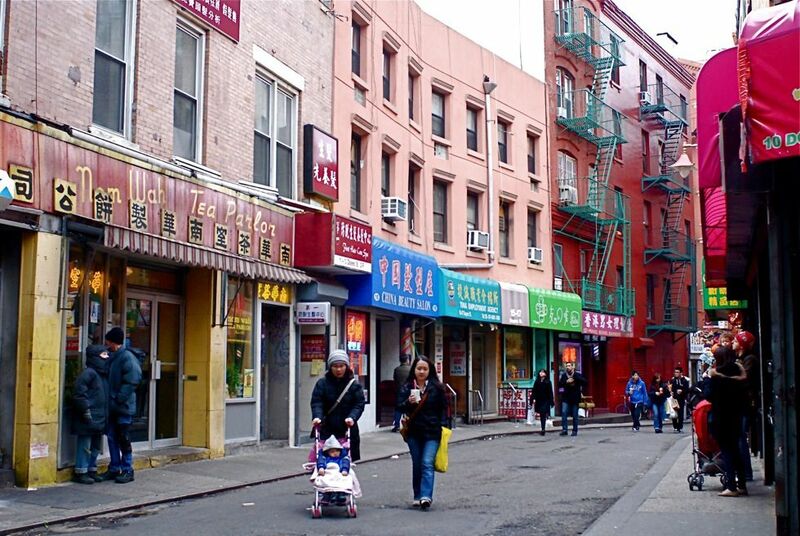 References for Commercial Shared Street: 7 found. Pojani, Dorina. 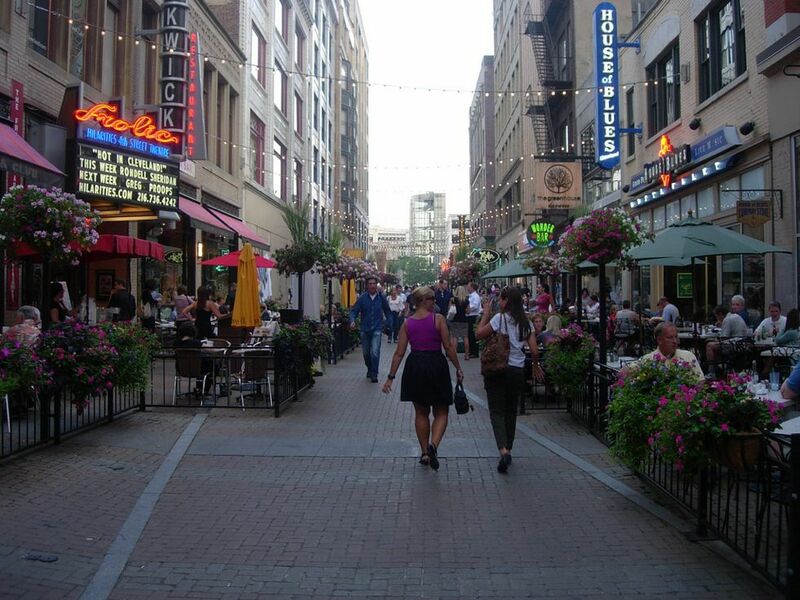 "American Downtown Pedestrian ‘Malls’: Rise, Fall, and Rebirth." Territorio 46, 173-190, Department of Architecture and Urban Studies, Polytechnic University of Milan, Milan. Niagara Frontier Transportation Authority. 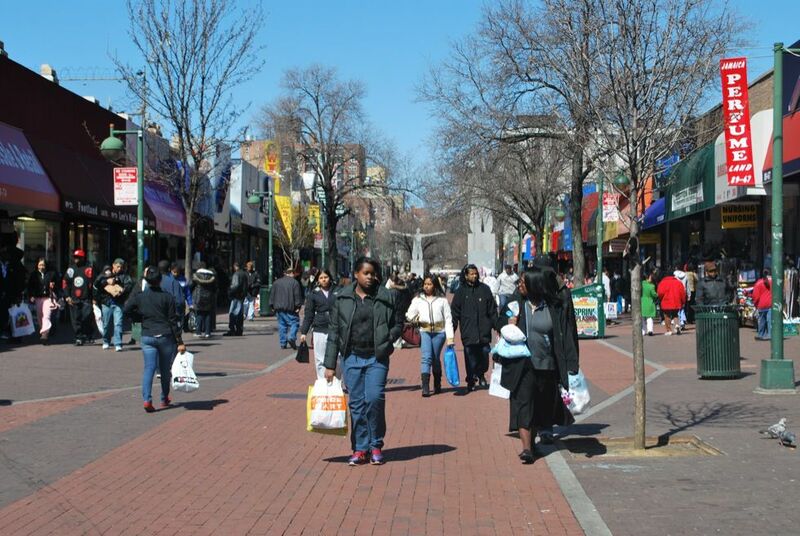 "Appendix A: Experience of Other Communities with Pedestrian Malls." Niagara Frontier Transportation Authority, Buffalo, NY. Schmidt, Jessica. 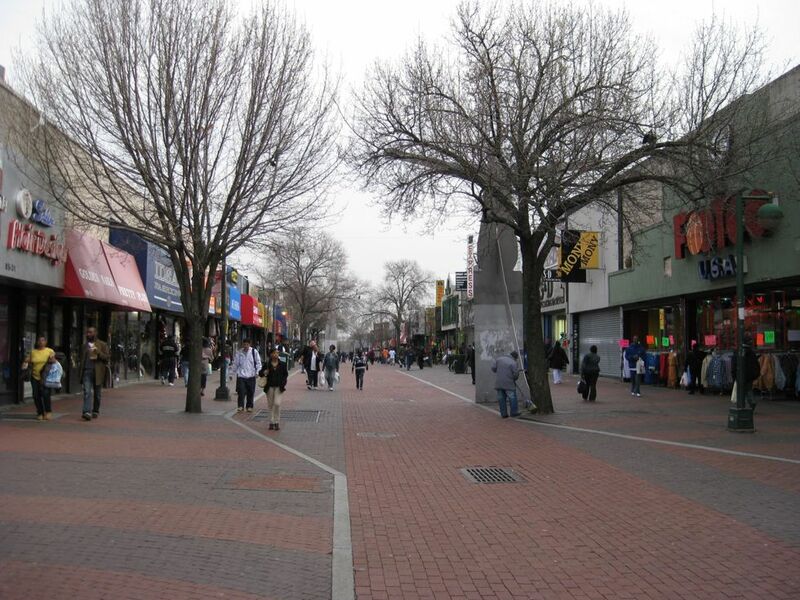 "Revisiting Pedestrian Malls." Prepared for the ITE 2010 Technical Conference and Exhibit, Institute of Transportation Engineers, Savannah, GA.
Department for Transport. 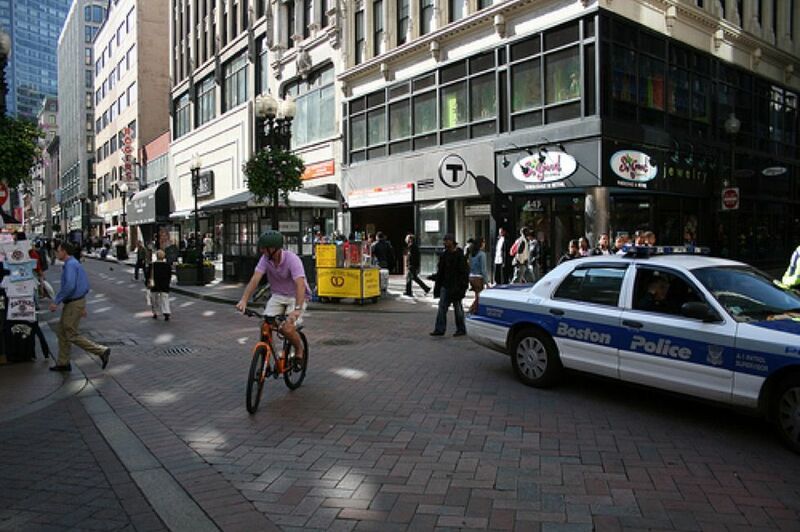 "Shared Space." Local Transport Note 1/11, Department for Transport, London, EN. San Francisco County Transportation Authority. 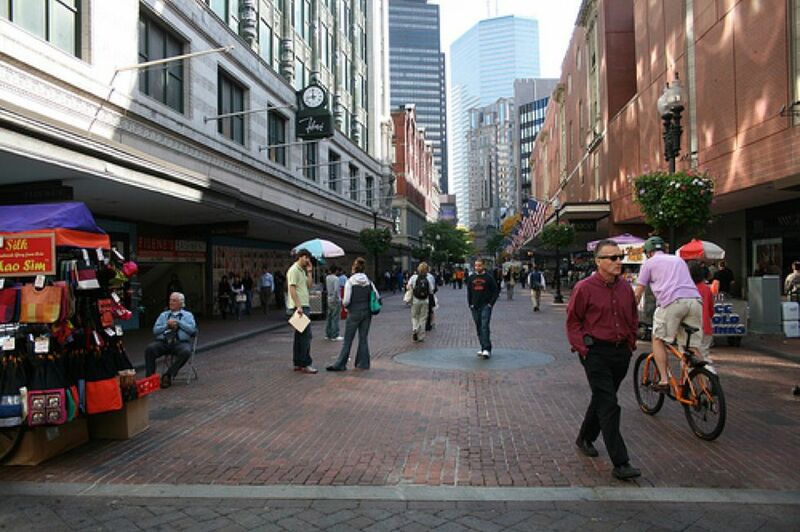 "Transit Mall Case Studies." San Francisco County Transportation Authority, San Francisco, CA.